Who could resist pork belly rashers grilled to perfection over a fire? 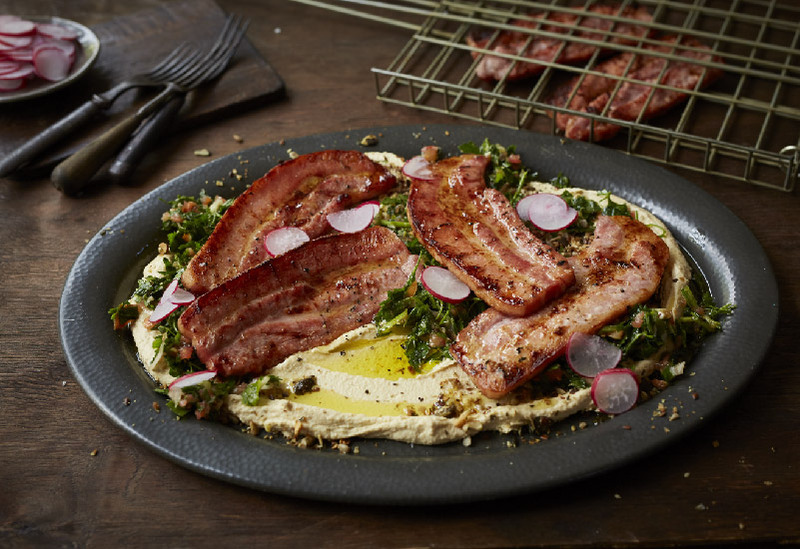 Our Smoked Pork Belly Rashers, from our Smoked Braai Range, are given a fresh and fragrant boost in this Middle Eastern-inspired tabbouleh. To make the Tabbouleh, mix all the ingredients together to combine all the flavours and set aside until ready to assemble. Once the fire is ready, grill the Smoked Belly Rashers on high heat for about 4-5 minutes each side until its beautifully charred but cooked through. Set aside to rest and keep warm. To serve, start with a large platter and spread a thick layer of hummus on the base. Next, add a heavy sprinkle of Dukkah on top of the hummus. Add the Tabbouleh to cover the hummus. Top with grilled rashers and a few thin slices of radish to add extra colour and crunch. Finish off by drizzling olive oil all over the grilled rashers, enough for it to drip down onto the Tabbouleh to form a dressing. A little shake of paprika and you’re ready to eat!